One of the best parts about a trip to Tahiti is the ability to see, and interact with, an abundance of tropical sea life. In the islands of Tahiti, visitors encounter some of the most colorful, beautiful, and exotic animals that can be found beneath the seas. Because the marine life is one of our favorite parts of a Tahitian visit, we wanted to highlight some of our favorite aquatic experiences in Tahiti. Did you know that the islands of Tahiti are some of the best places to whale watch? Every year between the months of June and December, Tahiti plays host to humpback whales, who travel from their Antarctic homes to Tahiti (where they have no natural predators) to find mates and deliver their calves. Famed for being directly in the path of the whales’ migratory journey, the island of Rurutu (a part of the Australs islands) is sometimes referred to as “The Island of the Whales.” Rurutu is the perfect place to take a guided tour and watch the migration take place. Prefer to stay in the Society Islands? Not to worry! There are some amazing whale watching opportunities in Moorea. There’s even a guided tour led by acclaimed marine biologist Dr. Michael Poole! The islands of Tahiti are an ideal place to go on a shark and stingray watching excursion. The water inside the lagoons is ideal for these excursions because it is relatively calm, which means that you can focus on the marine life and not on treading water. Take a guided excursion on Bora Bora, Moorea, or Tahiti to interact with, or feed, stingrays, black tip sharks, lemon sharks, and more! Tired of being a big fish in a small pond? Perhaps it’s time to snorkel with some larger creatures. If you’ve snorkeled with stingrays before, we recommend snorkeling with the much larger and more elusive manta ray. The great news is that you can cross that item off your bucket list in French Polynesia! In Bora Bora and Rangiroa, Pure Snorkeling by Reef Discovery offers guided tours that enable visitors to snorkel with these enormous and majestic creatures. Make sure to bring your underwater camera! If you’re a dolphin lover, you will be thrilled to learn that you can swim with dolphins in Moorea. The Moorea InterContinental Resort has French Polynesia’s only Dolphin Center. Here you can learn all about these magnificent creatures from the dolphin trainers, who give daily dolphin presentations, and you can take a dip with the dolphins. If you happen to be visiting the island of Rangiroa, you can also go Dolphin Watching, or watch the dolphins naturally swim by the coast each afternoon. It really is an incredible sight. Head to Bora Bora or Moorea to check out some seriously amazing reptiles. The Moorea InterContinental Resort & Spa also features a Sea Turtle Sanctuary and Rehabilitation Center. Here, turtles who have been injured, are rehabilitated, and lucky guests can learn all about these creatures from the Sanctuary’s staff. The Le Meridien Bora Bora also has a similar center, called Le Meridien Bora Bora Ecological Center & Turtle Sanctuary. Every day, endangered marine turtles, and baby turtles, are protected and cared for by a team of biologists and a veterinarian until they are old enough and well enough to be released into the ocean. 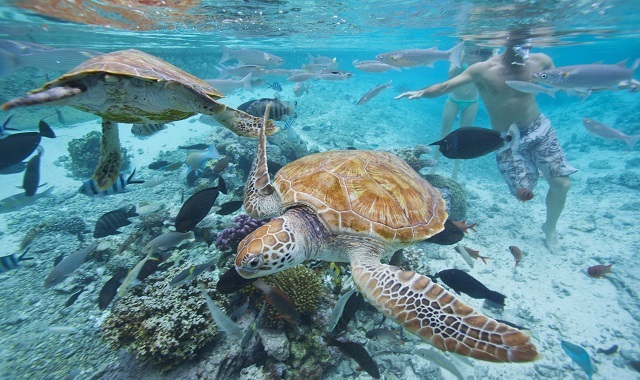 The Le Meridien Bora Bora Sanctuary offers exciting new experiences such as the “Live The Life of a Turtle Healer” experience, which allows guests to join the healer team of the turtle center for a day. You can help care for the animals and feed them. The other exciting new experience is the Turtle Feeding & Ecological Center Visit, in which guests attend the daily turtle feeding and then explore the aquatic curiosities of the Ecological Center. Contact our Tahiti Travel Specialists today to plan your perfect Tahiti aquatic adventure!